Most instruments with an RS232 serial port can be interfaced into a Windows measurement system with the Windmill RS232 software. Windmill Software includes a universal driver for instruments that communicate over RS232, RS485, Modbus and TCP/IP. It automatically feeds data from the instruments to Windows application software. You could, for example, show readings from a GPS receiver and a fluorometer in mapping software, or data from an electronic balance in Excel. The RS232 software is currently reduced from £145 to £50 and available from our data acquisition catalogue. A FREE TRIAL of the software is available to newsletter subscribers. Runs under Windows 10, 8, 7, Vista, XP and 98. Windmill supports both those instruments that continuously output data values as though to a printer, and those that require a command message each time data values are needed. With a flexible approach to building command strings, and parsing the received data strings to extract data values, the majority of analytical instruments are supported. These include altimeters, balances, conductivity meters, data loggers, dial gauges, digital indicators, digital thermometers, DMR, extensometers, flaw detectors, flow meters, fluorometers, force gauges, gas analysers, GPS, gyro compasses, hygrometers, I2C devices, ion gauges, load meters, motion sensors, multimeters, myographs, oxygen electrodes, particle analysers, pH meters, PIC microcontrollers, plcs, pressure transmitters, power analysers, RLC meters, RFID readers, thermoregulators, titrators, solar panel array controllers, sonar and water baths. You have the freedom to mix and match equipment from many different manufacturers in many combinations. Multiple channels of data can be accepted from each instrument. For example wind speed, wind direction, air temperature, sulphur dioxide concentration and carbon monoxide concentration may all be measured from one pollution monitoring station. Windmill can monitor data coming from up to ten COM ports at once. The free ComDebug software is limited to one port. Windmill has been used successfully with RS232 instruments from Acculab, A&D, Advantec, Ashtec, Avery Berkel, B&B Electronics, Bruël & Kjær, Campbell Scientific, Dataq Instruments, Daily RFID, Dataq Instruments, Datel, Datataker, Denver, Desoutter, Ecom, Fisher, Fluke, Funaro, Garmin, Geolux, Honeywell, Horiba, Humminbird, ICP DAS, Keyence,LOVATO electric, Love Controls, Linkcom,, Magellan, Maxim, Mettler Toledo, MecMesin, Metrix, Microchip Technology, Mitutoyo, Motorola, Molytek, Newmar, NovAtel, Nu-Metrics, Ohaus, Omnistar, Omron, Orion, Panametrics, Parallax, Parker, Protek, Quantum Logic, Remontec, Rockwell, San Jose, Sartorius, SG Brown, Siemens, Sokkia, Sylvac, Telegan, Transcell, Tritech, TTi, TSS, Turner Designs, Varian SenTorr, Veris, Vitrek, Voltcraft, Weeder Technologies, Weilheimn, WTW, World Precision Instruments and YSI and many other manufacturers. Selections are made from dialogue boxes: there is no programming required. Choosing how often to log data, and how to start logging. "Windmill allows us to create a poor man's bathymetry system for under $800 USD." "I needed a software program that can automatically send the appropriate commands to the OBDII device; interpret the response and make it available through Dynamic Data Exchange (DDE). 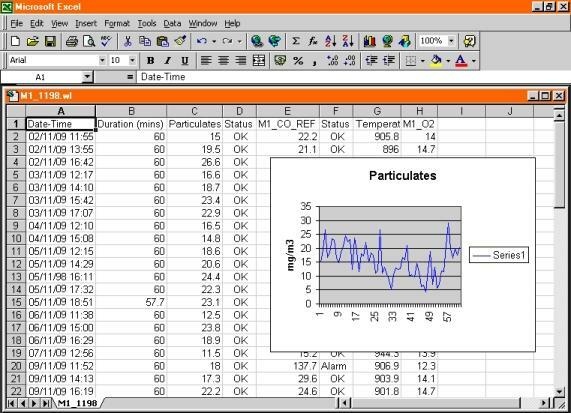 Searching around the internet I found Windmill...This program is perfect - it can request specific data through the OBDII interface and serve the data readings onto Excel." "I found your site while searching the net looking for info on programming a serial data access/logging system for home use in my electrical studies. Wow! I'm impressed! I've been operating high-tech instruments for 30 years in the Oil Refining industry, and always have had a basic understanding of this kind of technology...but you folks have simplified control and monitoring to the point of enabling a layman to bring high-tech control usage into the Personal Computer realm. Your free Windmill software download is much appreciated." "I was pleasantly surprised to find a product that did almost all of what I needed...I find that your products are often exactly what we need for data acquisition." "I am using the software to log a EZ compass (tilt, roll and heading). Works great and saved me alot of programming." "I am using a Froude Consine Texcel V4 control unit to control a dynamometer and have been using your free software to capture speed and torque data from the controller (the Froude software for this is over £1,000). Thus, your free software is fantastic and very easy to use. " "Very simple and easy to use software. Ideal for simple applications that do not require high rate data acquisition. Also Monitor is a very helpful newsletter for people that are not specialists in computer's communications, but are interested in data acquisition." "Thanks! It worked really well... very happy with the program." "...it saves a huge amount of time in writing and data entry, as well as preventing the problems of interpretation and mis-placing of data which sometimes occur with the old practice of recording the information on sheets of paper." The Windmill suite of software includes data logging, charting and control programs. You can also send data in real-time to Excel, Access or other Windows software. The new version of Windmill, which runs under Windows 10, 8, 7, Vista, XP, 98 and 95, is currently reduced from £145 to £50. As you download the software there are no shipping costs. We offer free technical support for life and a money-back guarantee: if not satisfied just ask for a refund. Alternatively you can ring us and buy over the phone: call +44 (0)161 833 2782. You might also find our RS232 connections page useful. If you have any questions please e-mail us at [email protected] or telephone +44 (0)161 833 2782 (9am-5pm GMT). Data saved in text files - eg in csv format. Choose the logging rate: anything between once every 24 hours to 5 samples per second per channel.